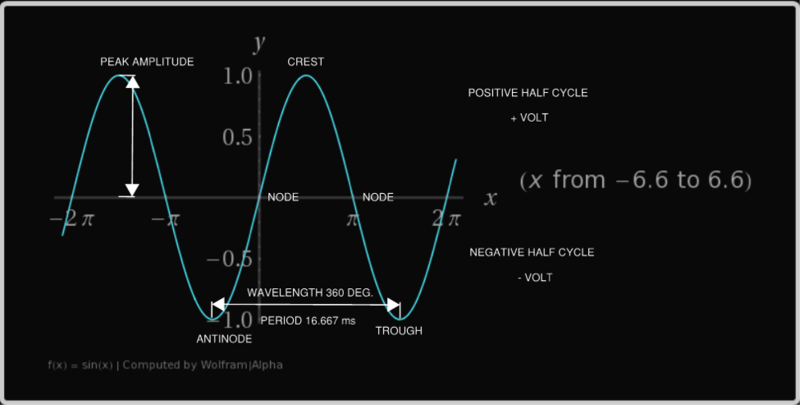 Frequency is defined as the number of crests of a wave that move past a given point in a specific amount of time. The most common unit of frequency is hertz (Hz), meaning one cycle per second. Generally, all power supplied to homes and businesses in the United States are 60Hz.In addition to being 60Hz, nearly all power provided to homes and businesses is of the alternating current (ac) form. AC power is a form of electrical current that reverses direction within a determined interval. The standard waveform of most AC power circuits is a sine wave, where the amplitude is a function of the magnitude of current passing through the circuit (Figure 1). The distance between two identical points on a sine wave, e.g.. two crests or two troughs, is called the wavelength. The wavelength depends on the operating frequency and not the passing current. The time between two identical points on a sine wave is called the period, and at a frequency of 60Hz (60 cycles per second) there will be a period of approximately 16.6 milliseconds, as shown in the diagram. A somewhat common mistake is to purchase a motor designed to operate at 50Hz or 60Hz when that frequency is not available. This error is typically made when motors are purchased from countries that operate on different standard frequencies. Operating a 50Hz motor at 60Hz will cause the motor to rotate above its standard RPM that, in most cases, will develop elevated motor temperatures and potentially damaging torques. Temperatures above design conditions will shorten bearing life and frequently result in premature failure. Running a 60Hz motor at 50Hz will cause the motor to rotate at a lower RPM than designed. A lower RPM will directly affect the performance of your pump, but may not damage the motor. Dual frequency motors are manufactured and available for many applications. When using a dual frequency motor, the start-up technician must wire the motor properly to avoid running on the wrong frequency. In summary, frequency is a predetermined factor when dealing with supply power and motors. Having a basic understanding of the properties of frequency will assist in understanding variable frequency drives (VFDs), motor frequency issues, as well as power phase and voltage. To learn more, check out our post on Choosing Your Pump Configuration: Single vs. Three Phase Power.